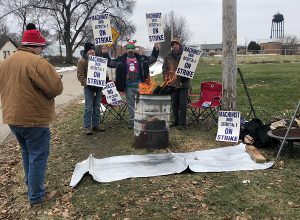 More than 170 members of IAM Local 2068 are on strike for better wages, benefits and working conditions at Silgan Containers in Rochelle, IL. More than 170 members of IAM Local 2068 at Silgan Containers in Rochelle, IL have voted to go on strike after rejecting the company’s contract offer. The strike took effect just after midnight Saturday, December 8, 2018. Silgan is the largest metal food packaging company in the country. The Machinists members are striking for better wages, benefits and working conditions. The post IAM Local 2068 Members on Strike at Silgan Containers in Illinois appeared first on IAMAW . Join Rep. Mark Takano & TCU NVP Ron Kloos on Facebook Live!